Leonard Braley The man who shared his footprint photos with us last week has given us some more exclusives regarding his interactions with animal planet. These updates come in the form of local news clips. One from WXII12.com and the other from News 14 Carolina. Unfortunately we could not embedd the video, you can either click on the pictures below of wait until you get to the links at the bottom of the page. 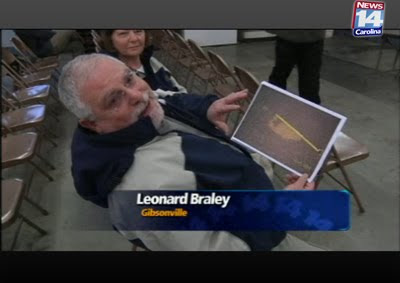 TROY, N.C. – More than a hundred people and a national TV crew came together Tuesday night in the Montgomery County community of Troy to talk Bigfoot. A team from the cable channel Animal Planet is shooting footage this week nearby in the Uwharrie National Forest. That's where Salisbury man Michael Greene shot footage in April 2009 which he believes is Bigfoot. The footage caught the eye of Animal Planet, which is shooting an episode of new show about Bigfoot sightings. The show's crew will be in the woods in coming days to hopefully get another look. "It's about time so many Bigfoot shows they all lead you that something's going to happen and then nothing does. Well in this one, something does happen," Greene said. Those working with the show told News 14 Carolina they expect the episode shot in and around Montgomery County will air in the fall. TROY, N.C. -- The quest to find the mythical Bigfoot continued in Montgomery County on Tuesday night. Producers, actors and the crew from Animal Planet met with members of the community at the Troy Fire Department from 6 to 9 p.m. to share their Bigfoot encounters. There have been several alleged sightings in the Uwharrie National Forest. 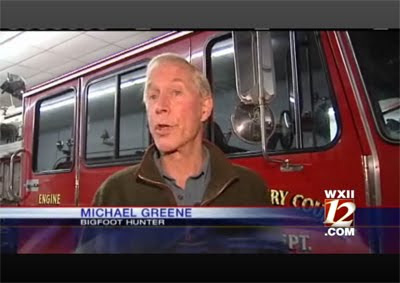 Michael Greene has been hunting Bigfoot for 20 years and helped organize a search party with film crews from the cable channel. Greene said he has video of a mysterious apelike creature and said he even knows Bigfoot's favorite treat. On Saturday, searchers will head into the forest to try to flush the big guy out.